Heartbreaking, quirky alt-folk epic from songwriter Ben Spencer. Alt-folk songwriter and producer Ben Spencer fills the quiet, comedic moments between breakdowns with brave poetry and extraordinary melody. 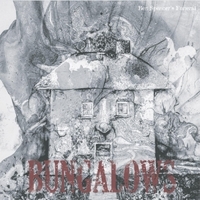 Featuring Bramwell Park on percussion and Steve Badach on upright bass, Ben Spencer's Funeral is the vehicle of Bungalows, a 10-song collection about the ways we contain ourselves. It explores the anomie of urban life, the existential quirk of love and the silence of the north. A longtime resident of Montreal and Edmonton, Ben has been featured as CBC Radio's 'Track of the day' and was a spotlight performer at NXNE and Folk Music Ontario. He's won various media awards, is a published poet, has toured extensively and is a mainstay on Canada's festival circuit, starring on stages from the Calgary Folk Fest to the Montreal Fringe. In the world of introspective, moody folk music, often-times earnestness is considered enough to make a song worth singing. It takes a little more to make it worth listening to. Ben Spencer has a keen grasp of melody. His clever word-play is enhanced by your desire to simply listen to the twin melodies that sometimes mingle between vocals and instruments. The only problem with lionizing Ben Spencer as one of the most gifted lyricists in Edmonton would be that it would give short shrift to his songcraft, and that would be a disservice indeed." "Singer/songwriter Ben Spencer was also a festival discovery. He's an appealing modern folk performer with a lively acoustic sound and terrific lyrics."